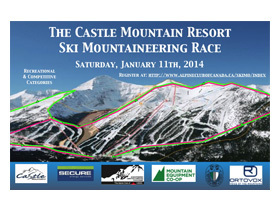 The 2nd annual Castle Mountain Resort (CMR) Ski Mountaineering Race (Skimo) is in the books. 29 racers joined in the fun with 14 volunteers in support. The representation in all divisions (Recreational & Competitive, Junior & Masters) was a particularly positive outcome. The recurring theme for the pre-race track setting and Skimo race was wind. 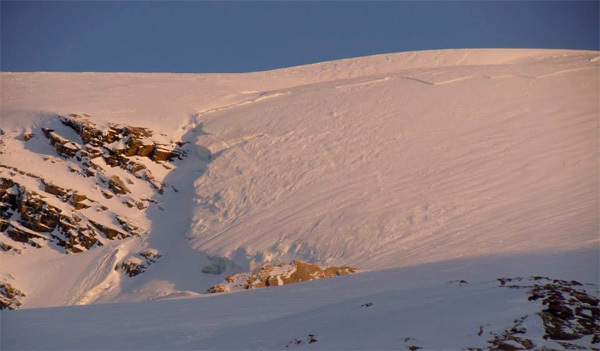 Of significance in relation to the wind is the hard work of CMR’s Mountain Safety Operations (MSO). These professionals had a mountain(s) to keep operational and they managed that plus, they were oh so accommodating in support of the Skimo event! Huge kudos to the MSO group and CMR Management for their support throughout the weekend. The Skimo route as depicted on the race poster morphed four times between Friday afternoon and the eventual start of the race at 11:00AM Saturday. Track setting on Friday by volunteers was obliterated likely as soon as the track was put in. A volunteer was blown over on Friday in the alpine. A snowmobile reconnaissance into the alpine early on Saturday morning returned with a very white and windy report. A key takeaway for race organizers of future Skimo events with high wind is that route pin flags should be zip-tied to tree branches, bushes, boulders, and snags. That way they won’t blow away to Lethbridge and Skimo won’t be seen to litter. 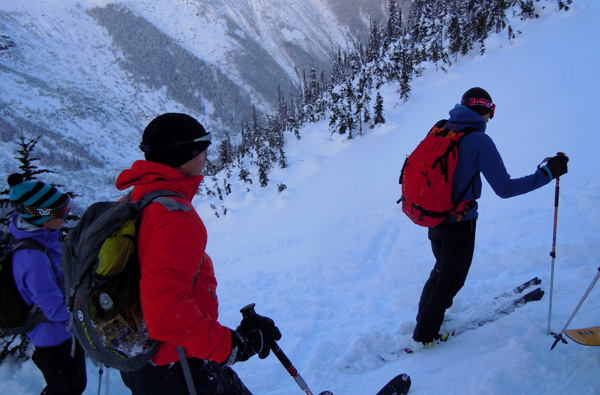 CMR’s MSO staff and Skimo organizers met a number of times to discuss what effect the wind was having on their operations and the Skimo route(s). By 10:00AM (the race was only delayed an hour) it was decided to do two laps on the Huckleberry and Haigh Ridge terrain, with the competitive division doing two laps and the recreational division one full and one shorter lap. The competitive division racers ascended/descended approximately 4168’ while the recreational division racers ascended/descended approximately 3168’. The skiing and boarding public witnessed the race start. Racers skated right by the day lodge in front of the Blue Chair. It was cool to field inquiries from the public during the race start and from the Huckleberry terrain enthusiasts. Everyone wanted to know what was going on! Some folks thought this was a great idea and others were dumb-founded that people would climb when there are lifts. During the awards ceremonies racers and volunteers alike reported that the event was a good one despite some minor delays and route changes. 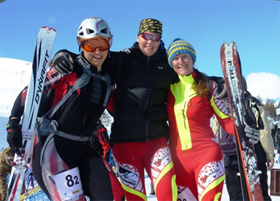 Divisional 1st, 2nd & 3rd place male and female finishers jumped up and stomped on the new Ski Mountaineering Competition Canada Podium. Thanks to all racers, parents, partners, spectators, media, and volunteers. Thanks again to CMR management, mountain safety operations and to the entire Castle community for embracing Skimo. Date: Saturday January 11, 2014. Location/Venue: Castle Mountain Resort, SW of Pincher Creek Alberta. Categories: Men’s and Women’s Recreational and Competitive. We may add a Junior (13 – 17) category and a Masters (+50) category depending on registration #’s. Number of ascents and descents: 3 and 3. Good to know: No special equipment requirements. Castle Mountain has a reputation for high winds. Choose your race clothing and layers appropriately. Great views of surrounding area once North Ridge is attained on first skin section. From North Peak summit an interesting boot pack descent. A 2000’ straight fall line descent on Lone Star. Ascent of Haig Ridge to access Powder Stage Coach cat skiing terrain prior to final descent back to village and finish. Ascent of Huckleberry chair terrain and final descent of Sidewinder back to village and finish. Friday January 10/14 course setting during the day. 8:00PM – racer registration and technical briefing in boardroom of day lodge (basement). Saturday January 11/14 RACE DAY! 08:00 racer registration. 08:30 – technical briefing. 09:45 Racers to start area for beacon check. 10:00AM – Race starts. Competitive racers start out at the Castle Mountain base area with good opportunities to jockey for position and pass others before the skin track becomes single and goes into the forest. Numerous switchbacks are negotiated before popping out on to North Ridge. From North Ridge peak, a boot pack descent along a rocky and exposed ridge before boot packing up to top of the Red chair. Racers follow flagging pins to the chutes area for a 2000’ descent on Lone Star. Ascend to the top of the Huckleberry chair and beyond to top of cat skiing terrain on Haig ridge. Final descent down Fist Full of Turns or Roll your own (TBD on race day) back to finish and village base area. Recreational racers start out at the Castle Mountain base area with good opportunities to jockey for position and pass others before the skin track becomes single and goes into the forest. Numerous switchbacks are negotiated before popping out on to North Ridge. From North Ridge peak, a boot pack descent along a rocky and exposed ridge before boot packing up to top of the Red chair. Racers follow flagging pins to the chutes area for a 2000’ descent on Lone Star. Ascend to the top of the Huckleberry chair. Final descent via Sidewinder to finish and village base area. Special equipment required: ISMF required gear. No special equipment needs. Cash prizes for 1st ($250.00), 2nd ($150.00), & 3rd ($100.00) place podium finishes in Men’s and Women’s Competitive category. Draw prizes from our sponsors. Prizes for Recreational, Junior and Masters categories will be equipment/gear (donated by our sponsors). With a high pressure system locked in, we were certainly not expecting the daily refills we enjoyed last year in the Tree Triangle. A warm summer leaving the glaciers full of poorly bridged crevasses and a recent avalanche cycle led to a slight change in ambitions. But any reservations regarding ski quality vanished with the first descent down from the hut where we enjoyed some fast skiing in settled powder from snowfall earlier in the week. We then climbed up an efficiently-angled skintrack that Brad and Igor had put in the day before and skied multiple laps there until the slopes above started to warm up. Then we headed to the other side of the valley and proceeded to put more tracks down a moraine feature. After hauling our carcasses slowly back up to the hut, it was time to begin the recovery process so that we could go just as hard the next day. Fortunately there was lots of food to eat and we enjoyed excellent sleep, going to bed early in the cozy Asulkan Cabin generously provided by the Alpine Club of Canada. We would need to bring our A-games as Melanie had just rolled up sporting her race gear. Sunday began as expected: with the boys chasing Melanie. I think everyone was able to exhibit some of their strengths. Melanie, Brad, Steve, and I were all skiing fast for the first half of the day. Marg skied up at the front during a midday lap, while Michelle, revived after a brief stop at the hut, was able to put in some additional laps above the hut to add to her impressive vertical total. According to my legs, the end of the camp came at the perfect time after a tiring ski down the Asulkan drainage under the weight of a big backpack. I was content to simply drive away from the best skiing that I have had so far this year, while Melanie, Brad, and Michelle pushed on for another day. 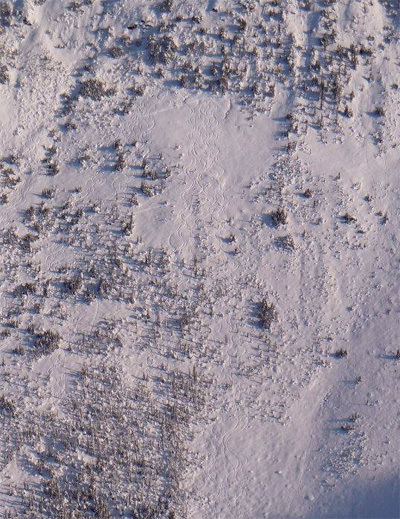 Fracture line on the slope leading up to Youngs Peak. 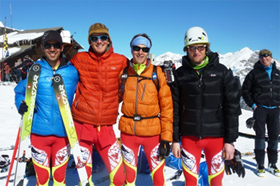 Announcing the Canadian National Ski Mountaineering Team 2014! 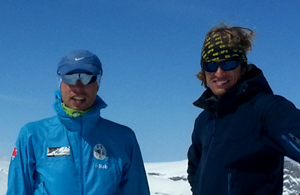 Stano Faban (left) and Peter Knight during their one-day Wapta Icefield Traverse in April 2013. Overall Canada Cup Championship for 2013 went to Stano Faban, who brought peak conditioning to exactly the right events to deliver a narrow win over resident American Eric Carter. A man who has grown up walking his talk, Faban also leads as a consistent mentor to Junior competitors, a race organizer and official, and as the wrangler of the leading English language website for our sport – Skintrack.com. Young and promising Peter Knight became the Canadian National Ski Mountaineering Champion in March where he was able to use newly picked up skills from just a month before during the 2013 World Championships. For 2014, National Team selection policy has been reviewed and fine-tuned, and those with ambition can find details here: http://www.skimocanada.org/national-team-members Cheer them on! Join them! Thanks and eternal gratitude to Niall Gleeson and Ian Gale, retiring from team efforts, but never from mountain skiing and their commitment to adventure. Ian is handing over leadership of the Dogtooth Dash to focus on new family. Niall will push the Vert 180 SkiMo race for one more year, and continues in a committee position, managing national rankings. Thanks as well to Rab, and The Alpine Club of Canada for their help and donations to the cause. Carla McKirdy, Melanie Bernier, and Martha Burley at the 2013 Worlds. Canada took a team of 8 to Pelvoux, France and turned in its best results ever. We finished 12th in the nations rankings (of 22 or 23 countries, many with many more athletes entered). Particularly strong performances were witnessed in Sprint, Relay, and Individual races. Reiner Thoni, Andrew McNab, Brad Schalles, and Peter Knight during the same event. Missing on the photo is Steve Sellers. Detailed results and rankings at http://ismf-ski.org/www/?q=node/185 Next World Championships will be in another two years, but there will of course be a complete World Cup calendar to contend in the 2014 winter. Expect more! Our team will outdo itself. www.mec.ca Our most generous and consistent event sponsor has always been Mountain Equipment Co-op. Good regional source for skimo gear. Come celebrate the snow with us! 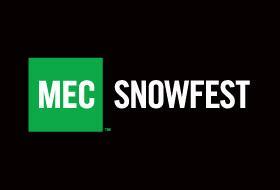 MEC Snowfest is taking place on Saturday, November 16th at the MEC Calgary Store, and the Vert180 and Ski Mountaineering Competition Canada is going to be there! Activities include: a gearswap, kids’ activities, snow clinics, ski/board consignment sale, ski waxing, avalanche safety workshops and much more!